The Rolex Sea-Dweller is the legendary deep-sea diver's watch, which was produced in the 1950s. Until 1954, the Rolex Submariner was the record holder with a water resistance of 200m. The new Rolex Sea-Dweller 1665 was able to withstand the enormous water pressure at the depth of 610m and returned to the surface without damage. Due to new developed helium valve the inner pressure in the watch could be diminished faster during the decompression and thus the breaking of the watch glass could be avoided, which was the case with the Submariners. 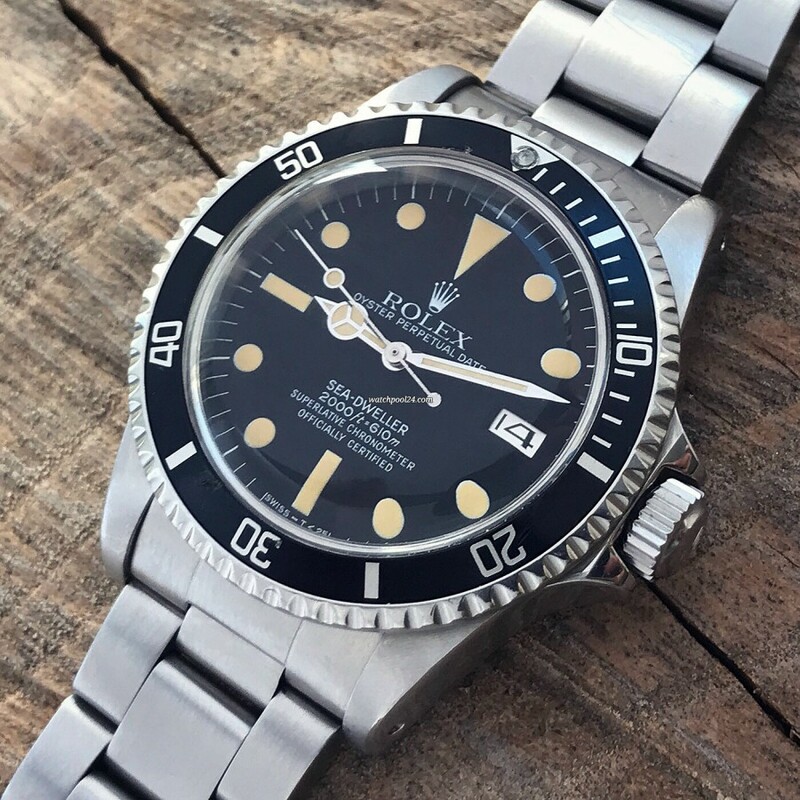 Here we offer you a Rolex Sea-Dweller 1665 from 1983. The highlight of this watch is the absolutely flawless matte dial with perfect and original tritium lume. The stainless steel case is fat and shows sharp lines and edges. The black rotating bezel has an intact pearl at 12 o'clock. The black insert has two small dents between 11 and 12 o'clock and at 7 o'clock, which are hardly noticeable when looking at the watch. The beautiful domed acrylic crystal is original and free of scratches. The Oyster bracelet has survived in great condition. The bracelet reference number is 93150 with 585 end pieces. The clasp is engraved with "Patented & Registered Swiss Made". The movement of the watch is the automatic caliber 1570 from Rolex. The watch is running perfectly, keeping accurate time. For half a century, the Rolex Sea-Dweller is the epitome of the classic diver's watch. And here you have the opportunity to purchase a great example of this legend and wear it on your wrist every day.